An amazing gluten-free, keto, flour-free, dairy-free tahini seed bread. It's magic! Flour-free, healthy & delicious! The first time I baked with tahini, I was absolutely amazed. Tahini binds just like a gluten-based flour. If you are a fan of tahini (or sesame flavored anything, for that matter), you will certainly adore this bread. It holds together, stores and slices well. Not to mention, it is a quick one bowl prep...and super easy! You can omit the coconut sugar without any issue if you follow a sugar-free or KETO diet. Alternatively, you can use a sugar-free sweetener such as this one. This is a versatile recipe. You can omit all spices or use a variety of your choice. Some variations that work well: cinnamon and nutmeg; cumin and chili powder; coriander and fennel seeds; garlic and rosemary. If you only have salted tahini on hand, you can use it instead but be certain to omit the salt in this recipe. This recipe will work without any seeds at all if you would prefer. This recipe will also work with any mix and match variety of seeds you would prefer to use instead. Be sure to allow the loaf to cool completely before slicing to ensure best results. This bread stores well in an airtight container in the fridge for up to 5 days. 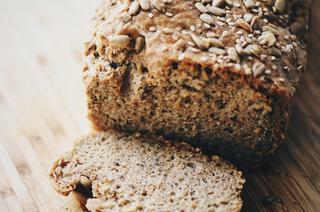 An amazing gluten-free, flourless, dairy-free tahini seed bread. It's magic! Preheat oven to 350° F. Line a loaf pan with parchment paper.Put all ingredients (apart from seed topping) into a mixing bowl & mix until very well combined.Pour your mixture into your loaf pan & then sprinkle the extra seeds on top.Bake for 40 minutes or until loaf is golden & firm.Allow to cool completely before slicing.Enjoy! *Optionally, this bread would work well with a few added teaspoons of any spices of your choice. I used the above, but please do flavor to your heart's content, as this bread is quite fool-proof!